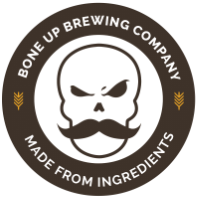 Stats: Armchair - Bone Up Brewing Co.
Color: If you thought it'd be super light you'd be quite right! Food Pairing: Venison pot roast. Music Pairing (Jared's Choice): Anything by Steve Hickman. Best Occasion to Drink: As a backup beer to tide you over between (and/or during) fancy beers on Thanksgiving. Brewers' Notes: We know full well that now's the season for big ol' boozebombs, but we can't forget the fact that it's Gravy Month and we gotta beer up them turkey times, so we made this refreshing lil' saison to wet your whistle while you go to town on some stuffing and/or nap on the couch. Cheers!